14,639 Tests runs in one hat-trick. 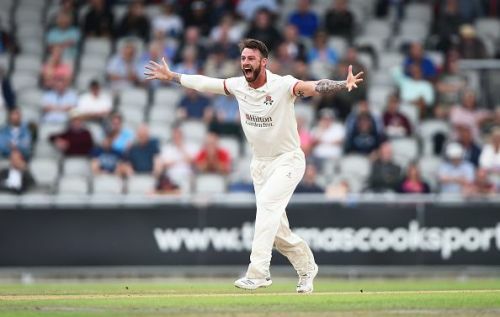 Lancashire's Jordan Clark certainly hit the jackpot. 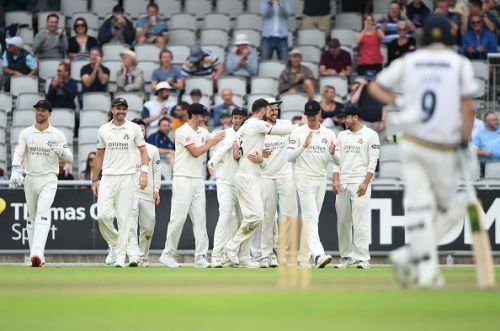 On the opening day of the County Championship's Division One game for Lancashire, 27-year-old Clark ran through the Yorkshire batting line-up in the first session, claiming the wickets of Joe Root, Kane Williamson and Jonny Bairstow with a hat-trick. All three are part of the top-20 in the ICC Test rankings. Clark isn't new to claiming the limelight out of nowhere - in 2013, he became the first English player to hit six sixes in professional cricket. Surprisingly, he had not even made his first-class debut when he achieved the historic feat. The sensational effort unravelled in the 19th over, after Graham Onions had already accounted for the wicket of Harry Brook, one of the openers, in the fourteenth over. He first dismissed Joe Root with a peach of a delivery that moved just enough to catch Root's front pad and miss his bat. The England Test star's 19-ball 22, laden with five fours, was suddenly nipped in the bud. What followed was sensational. He followed it up with another beauty that seamed right in and cut Kane Williamson in half. The Kiwi batsman, who is on contract to play four County games for Yorkshire, failed to judge the delivery and was hit right on the pads, in front of the stumps. The final victim of the hat-trick was Jonny Bairstow, who fell for a golden duck that completed Clark's feat. While the first two deliveries were angled into the stumps, the third one swayed away, forcing Bairstow to play at it. He ended up handing a simple catch to the slip cordon. He became the first bowler to take a hat-trick in a Roses Test since Ken Higgs at Headingley in 1968. He also managed to effect a run-out, claiming Tim Bresnan's wicket later in the day.